Decongestive lymphatic therapy (DLT) combines skin care, compression (using bandages or garments), manual lymph drainage (MLD), and remedial exercises. DLT is currently considered the most effective treatment available. DLT therapists are specially trained and certified. Consult the LAQ Resource Guide for a therapist in your area. Multi-layer compression bandaging is the application of multiple layers that include protective covering, soft padding, and compression bandages. Various compression bandaging systems are available. LCB aids muscles in stimulating lymph flow and prevents re-accumulation of swelling. LCB can be worn 24 hours a day. LCB is applied by trained therapists, and those with lymphedema should be taught how to bandage themselves. Manual lymph drainage (MLD) is a specific, gentle massage that stimulates lymph flow and redirects the lymph fluid to areas of the body where the lymphatic system is functioning. Special techniques help to break down hardened tissue. Those with lymphedema can be taught self lymphatic drainage (SLD) techniques by a trained therapist. If starting a new or returning to a former exercise program, follow the exercise guidelines set up in the pamphlet. Exercise, deep breathing and movement stimulate lymphatic flow. Mobility and activity are encouraged to maintain normal functioning during decongestive therapy and after. General exercise helps build strength, maintain joint mobility, promote healthy body weight, increase fitness and prevent injury. In general be as active as you can. Pneumatic pumps are sometimes used to treat lymphedema; however, they have the potential complication of pushing fluid upwards and causing swelling and hardened tissue above the treated area. Pumps are best used in conjunction with DLT and under the guidance of your therapist. Diuretics are generally not recommended for the treatment of lymphedema because they remove water and increase the buildup of protein which can harden tissues and increase inflammation. However, you should remain on this medication if it is given for another health condition. Please discuss any questions with your doctor. Once lymphedema is stabilized through DLT (usually 2 or more weeks) your therapist will help your transition to self-management which includes ongoing skin care and the following components. Compression garments stabilize swelling and are an essential part of long-term treatment. Garments must be prescribed by a doctor and fitted by a trained measurer. They can be off the shelf or custom-made, but they must fit properly. Compression garments are worn during the day, especially during times of high activity, and removed at night. A variety of other non-elastic compression products are available for night use. When waiting for a new compression garment to be delivered, it is recommended that you keep your lymphedema stable with self-bandaging. 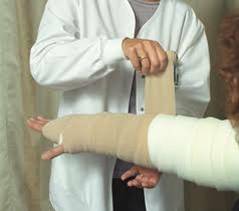 In some cases, to maintain treatment results, the therapist will advise and teach self-bandaging. Consult your therapist for instructions on self-massage techniques. Self-measuring is a quick and easy way to monitor a lymphedematous limb. Measure once a month if your lymphedema is stable, and more frequently if it is variable. Keep a record of your measures. If you limb becomes more swollen and self-bandaging does not control the increase, consult your therapist.